Uzbek carpets have usually been woven by women in their homes in rural areas. Uzbek weavers are also found throughout Central Asia, Turkmenistan and northern Afghanistan, and they produce a large variety of kilims and pile rugs. 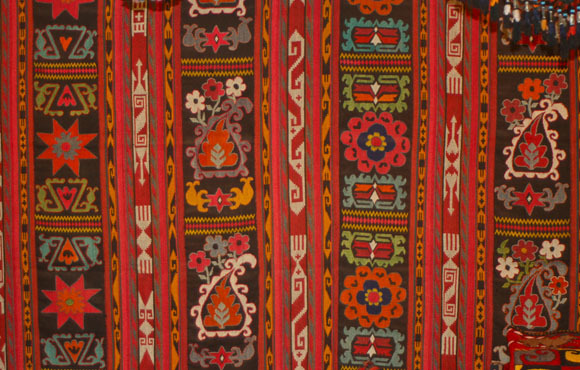 The kilim or flatweave above was woven by the Lakai nomadic tribe, probably in the mid-20th century. We will write more later about this fascinating tribe, who are the only real nomads remaning in Central Asia. To learn more about Uzbekistan visit our Carpet Country profile page about Uzbekistan.